The Oakley Creek shared path runs between Unitec and New North Road, Mount Albert. 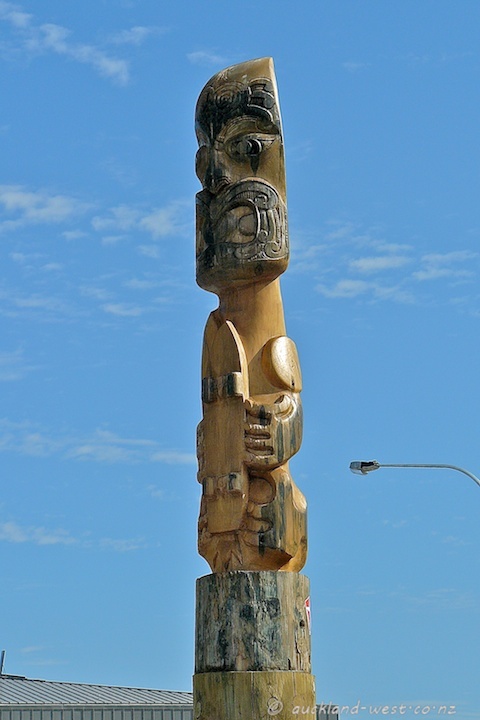 About halfway along is this pou (guardian pole). 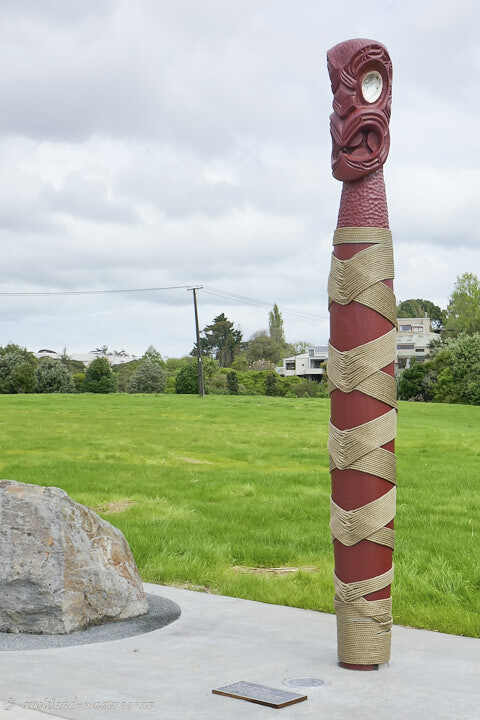 This pou (carved post) stands above the still fairly new Taumanu Reserve, at the southern end of the pedestrian/cycle bridge crossing State Highway 20. 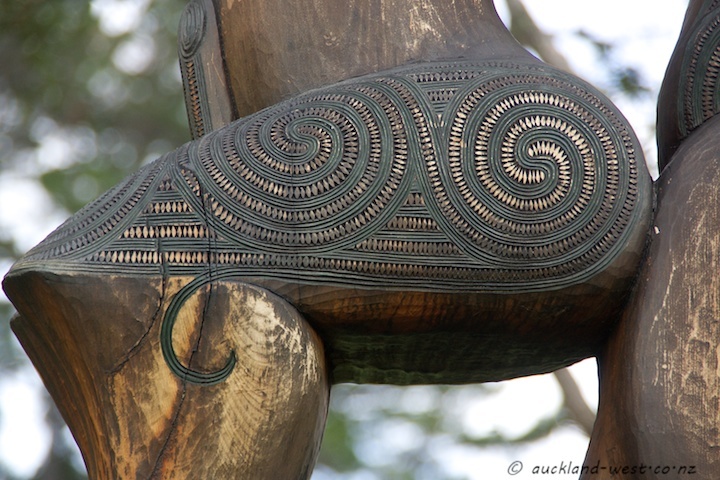 The work of master carver Ted Ngataka. 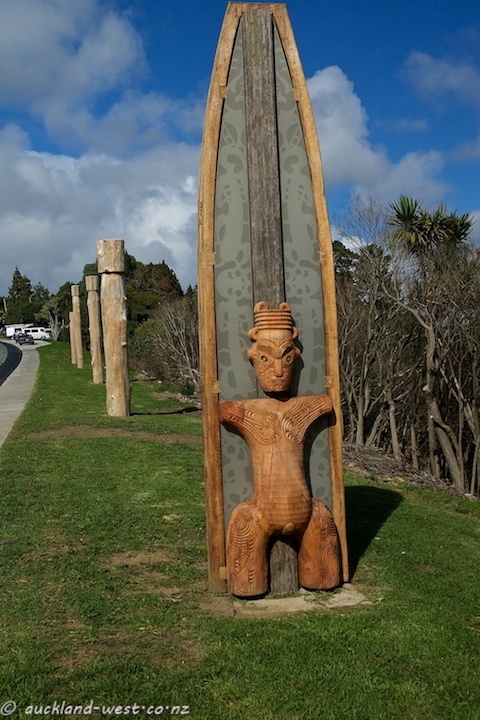 Each of the approaches to the Huruhuru Creek bridge on Triangle Road (Henderson/Massey) are decorated with a row of pou (poles), and a pair of guardians in the shape of a boat closest to the bridge. Salvaged totara logs and aluminium. 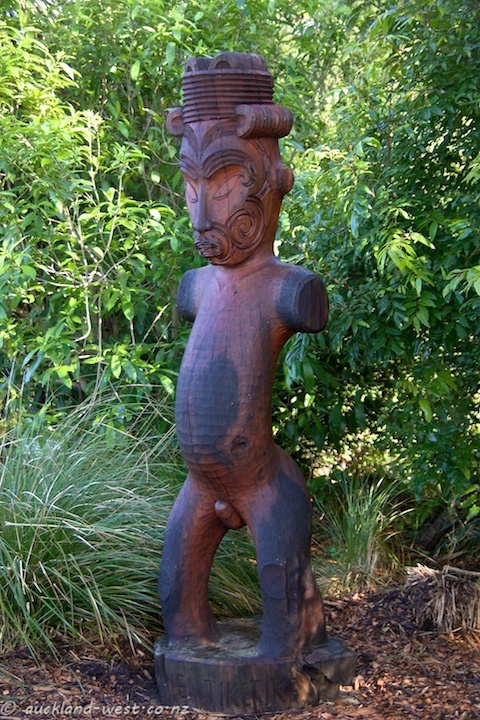 Carved by Whare Thomson. 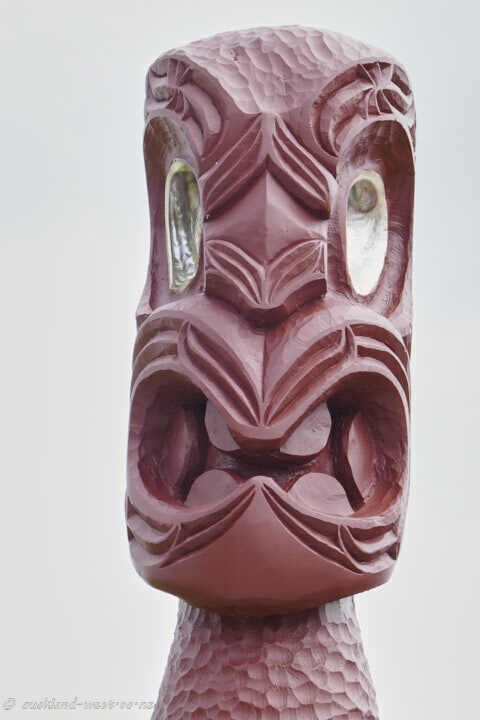 Carved by master carver Whare Thompson in collaboration with Maori studies students from Henderson High School. 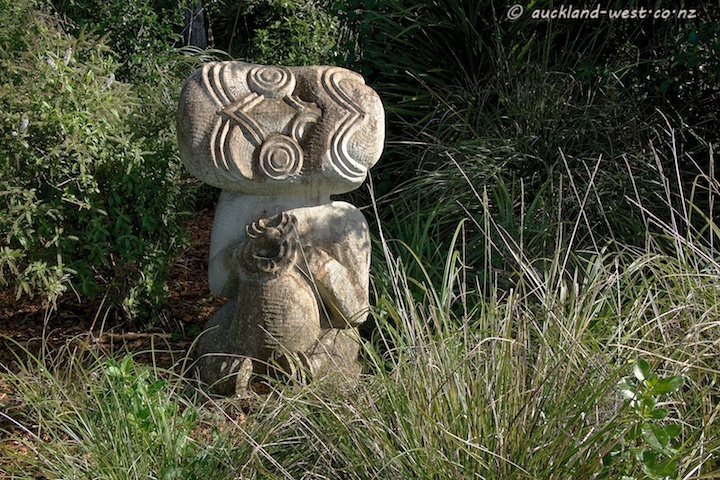 Rongo-Ma-Tane, the Maori God of cultivated food, carved from Hinuera stone, and Haumie Tike Tike, the Maori God of uncultivated food, carved from totara. 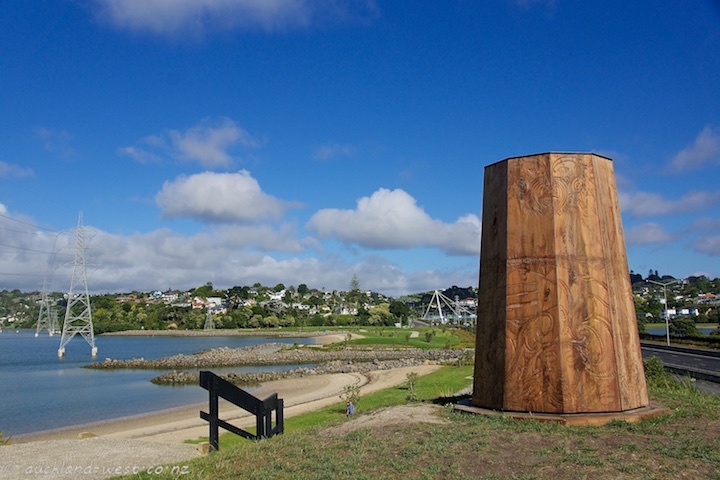 These two pou (posts) are part of “Te Maara Oranga” a garden just south of Henderson Park along the Opanuku cycleway. There are plaques identifying various native plants and their uses in traditional medicine. 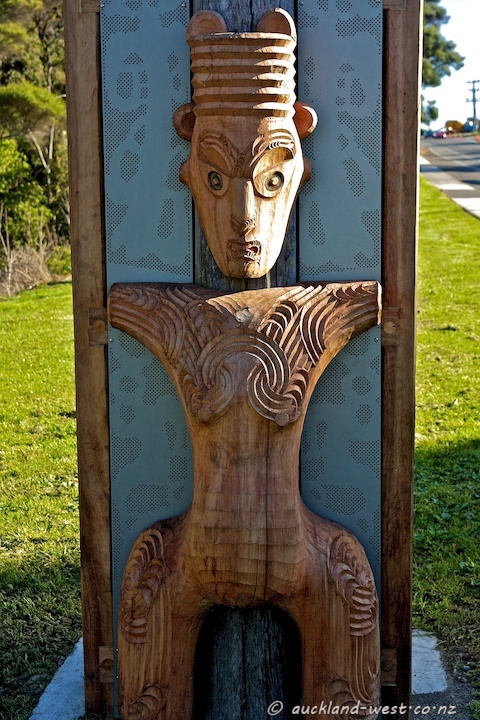 Near the Pine Avenue entrance to Cornwallis Beach stands this pou, depicting Hape (an ancestor of the local Kawerau-a-Maki tribe) and local taniwha (guardians of the Manukau Harbour). 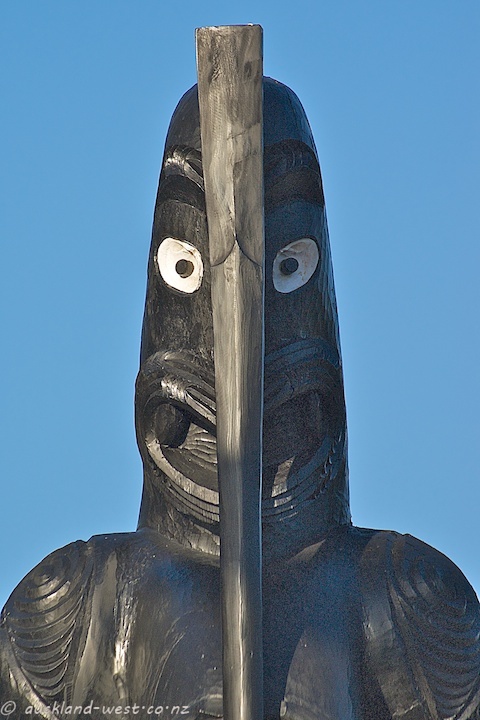 Tiriwa is an ancester of the local Maori tribe, the Kawerau a Maki. 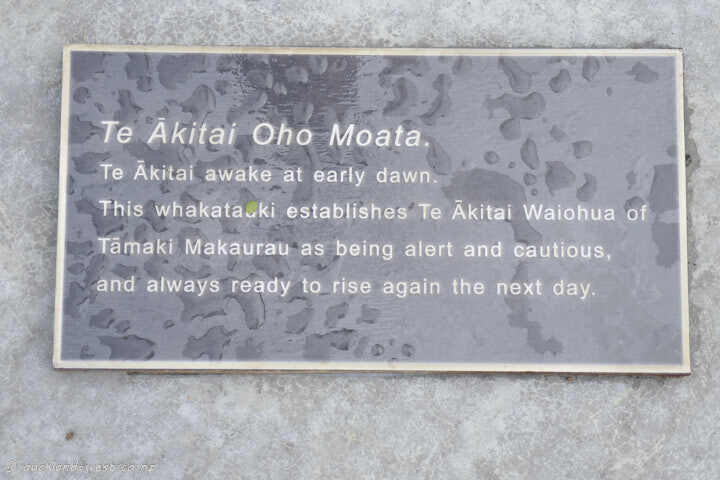 Their name for the Waitakere Ranges is “Te Wao Nui a Tiriwa” (The Great Forest of Tiriwa). 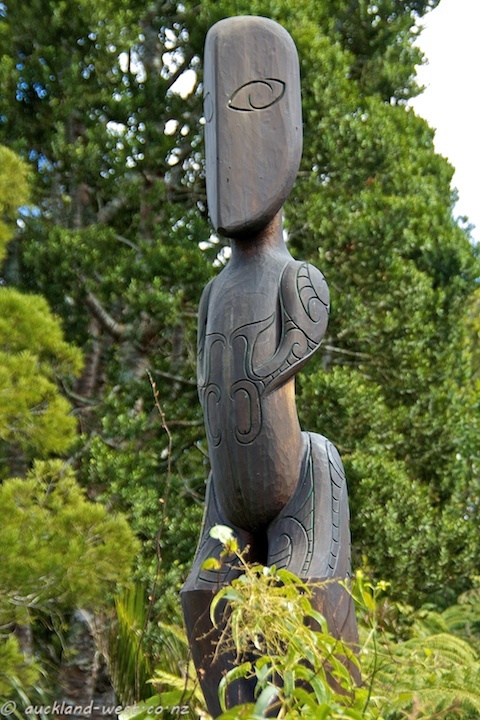 The main carver of this pou, situated out the back of the Arataki Visitor Centre, is Sunnah Thompson, showing a minimalist styling in this pou. 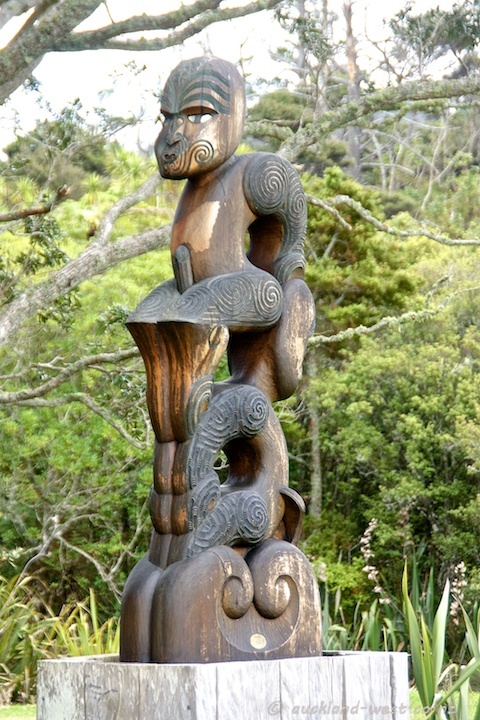 A more elaborate version is seen on top of the pou in front of the centre. A $1 million skate board and BMX course opened at Beaumont Street in October 2011. 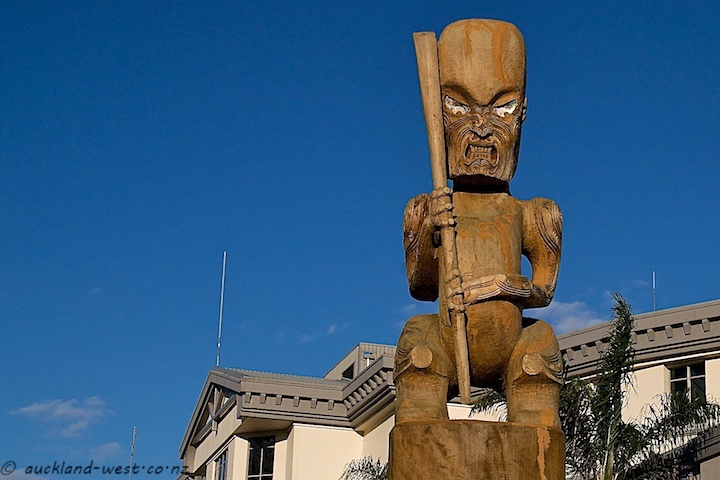 It incorporates two pou (Maori carvings in the form of poles), one named Waiatarau, carved by Lenard Phillips, and the other Te Mau Mahara, carved by Lee Ralph – the latter aptly clutching a skateboard, updating traditional shapes. Artist Lenard Philips, who created the first piece, says the area was once a busy fishing spot where shellfish were gathered. Fellow artist Lee Ralph created the latter piece and is proud to have his work on display. See some of the action on the Auckland City Harbour News (scroll down for videos). This pou guards Entry D of Eden Park. 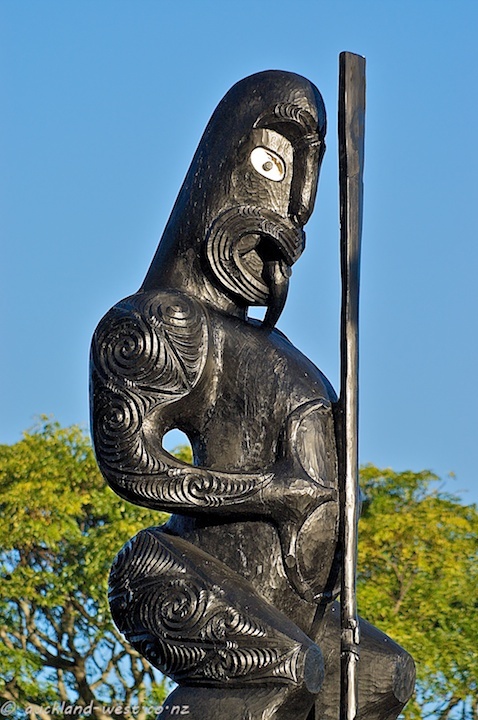 Tūmatauenga, Māori God of war, stands above wielding a taiaha – a traditional combat staff employed in times of conflict. 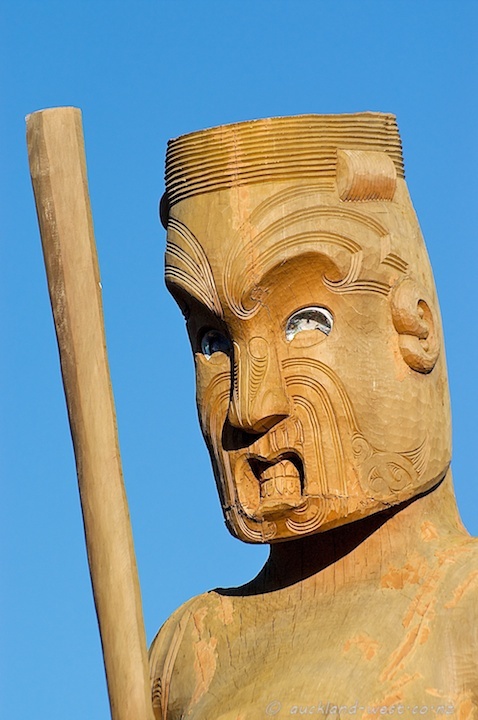 As a dedication to this deity of contest, any arena where battle ensues is bestowed the name Te Marae Ātea a Tūmatauenga – the battle domain of Tūmatauenga. In today’s context, Eden Park is such a place. A domain of battle where contemporary gladiators clash under the banner of sport with an intensity and ferocity reminiscent of that of the ancestors. 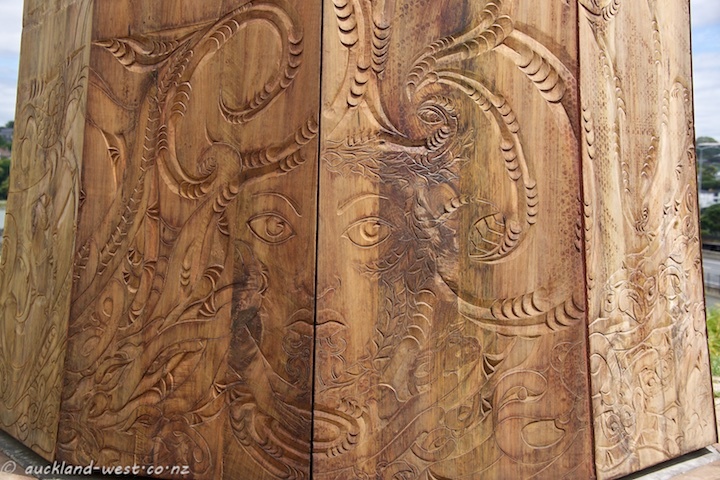 Carved by Boydie Te Nahu, October 2010. 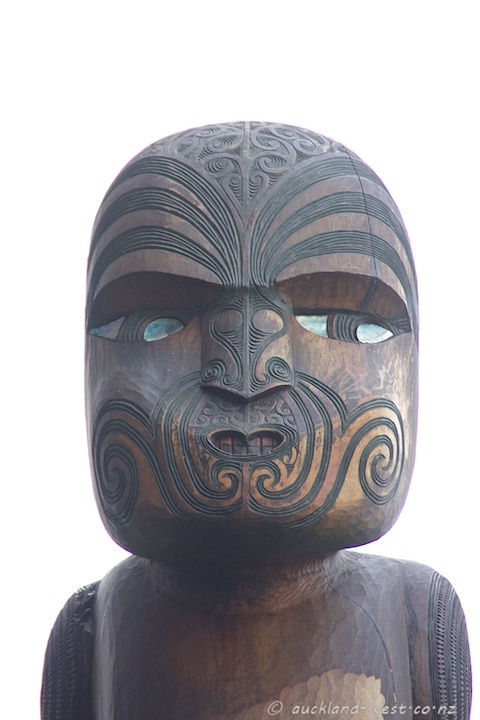 This pou stands at Entry A of Eden Park. 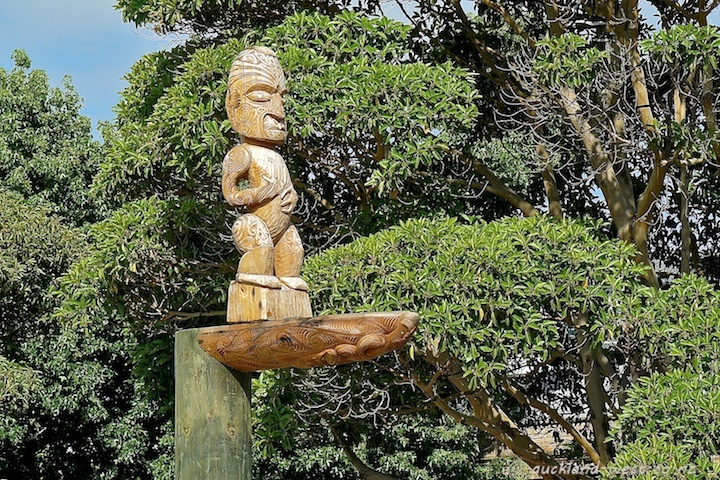 Tāwhirimātea, Maori God of wind and weather signifies the natural elements and their collective influence on the nature of sporting contests. 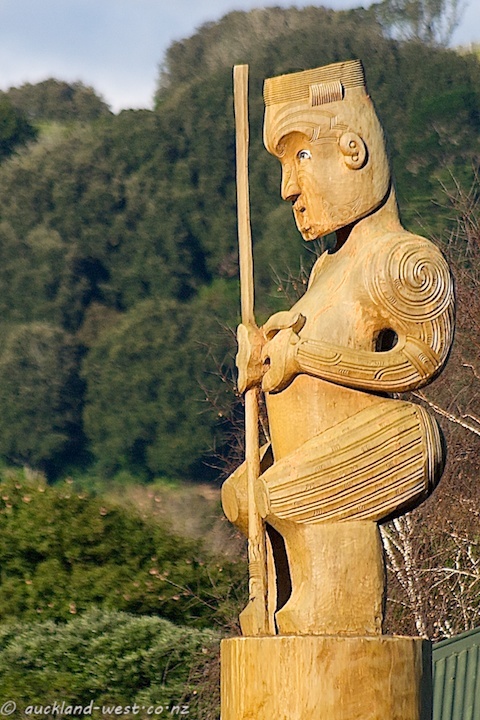 Tāwhirimātea holds the Tewhatewha, a weapon used by the commanding leader to direct warriors into battle formations. 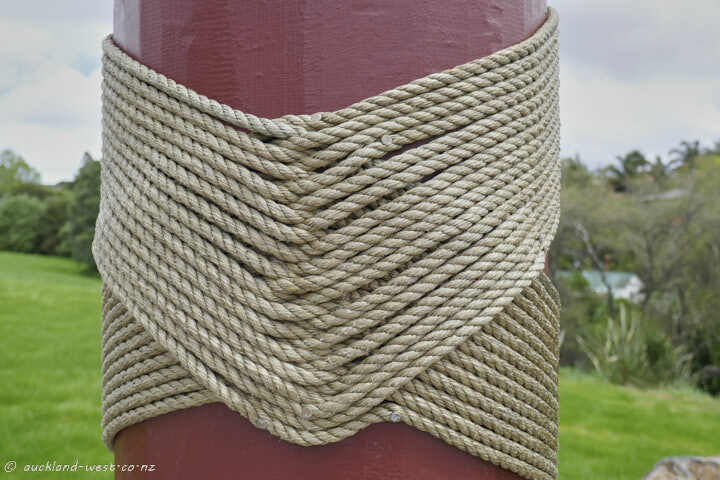 The Tewhatewha is used in a swirling motion to mimic the movement of wind and, as such, is an acknowledgement of Tāwhirimātea. Carved by Iwi Le Comte, Octobert 2010. 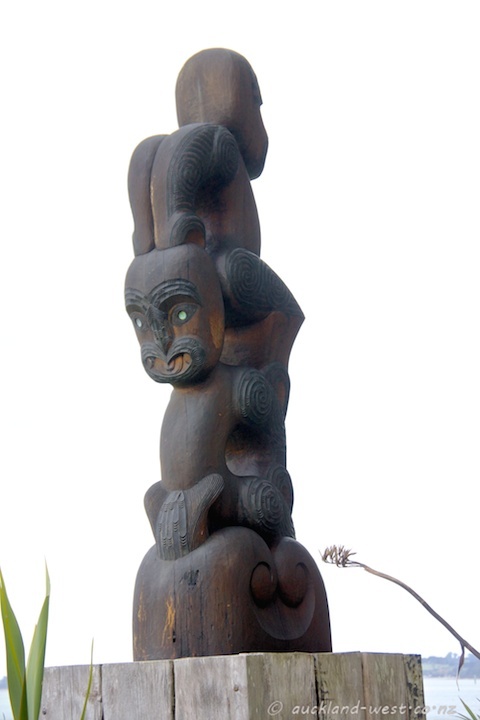 Tānemāhuta, Maori god of the forests, bears the pou whenua – a tool traditionally used to mark tribal boundaries and engaged with equal distinction as a weapon should those boundaries be contested. 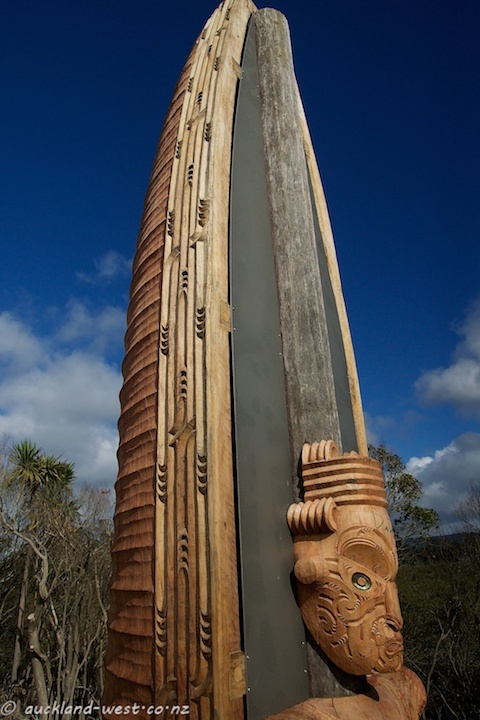 Tānemāhuta is also credited with the ascension to the highest heavens to retrieve the three baskets of knowledge that brought understanding and enlightenment to mankind.